I want to bless the God of Christ Apostolic Church, The Lord who from the inception of the world had conceived and deliberately formulated the intention to found the apostolic belief founded on the pedestal of Christ Apostolic Church. God of our Fathers made use of the patriarchs who surrendered themselves for the move of God one hundred years ago. Our God so great, He placed this church on a formidable foundation so virile which withstood, fought, defended and overcame every onslaught of the enemies for this century under review. Christ Apostolic Church is a creation and an offshoot of the Holy Ghost’s concept of independent Pentecostalism. This is a Mission that went all out in the power of the Holy Spirit just like the day of Pentecost against much evil and daunting spiritual highhandedness all over the place. A calling that capability was no required credential for God’s use to found and create a thriving ministry of the Holy Spirit but a simple availability and willingness to be used. The foundation laying stones of this Mission were laid in a concerted effort of Men and Women of impeccable and unblemished spiritual uprightness and readiness. This mission that was conceived five scores years ago has culminated and metamorphosed into a global cynosure of all eyes, a deliverance haven, an abode to refresh and quench stunting thirst for salvation, healing and freedom. It is on this behest I welcome you to this service signalling the commencement, observance and conduct of the centenary service of Christ Apostolic Church (Worldwide). I bring you greetings from the leadership of our Church. It is a rare privilege for all of us to be witnesses at the celebration of hundred years of the corporate existence of our church. I am very elated to warmly congratulate all the ministers of God for holding firm the ideals of our mission. I am not incorrect to say the founding fathers would be pleased to see how the seed they planted has grown into a mahogany of immense stature. Prior to the coming into existence of Christ Apostolic Church and the myriads of exploits that God wrought through the patriarchs of our mission, African land was regarded as a ‘dark continent.’ The indigenous religion popularly known as African Traditional Religion was prevalent in Africa from time immemorial. The Yorubas worshipped Olu-Orun or Olodumare who was regarded as the Supreme Being in Heaven, the Hausas worshipped Ubandigi while the Igbos believed in gods and goddesses of rivers, mountains etc. God started his works in trickles in African lands by raising prophets, faith healers and prayerful men and women across the continent. The root of Christ Apostolic Church is traceable to God Almighty who called His Ministers, David Odubanjo, Oba I.B. Akinyele, Daniel Orekoya, Apostle Joseph Ayo Babalola, Sophia Odunlami and others and He imbued them with unction to function. God mightily used these spiritual giants to ignite the fire of Holy Spirit revivals. Through the powers of prayers, forbidden forests, mountains and regions were conquered, demons were silenced, souls were saved, witch-doctors were paralyzed and hospitals were emptied by the healing power of our Lord Jesus Christ. It was during this period that God raised a pregnant woman back to life who had died with the foetus. 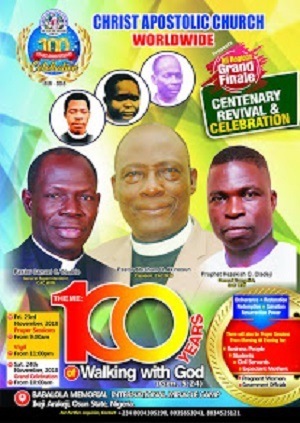 The advent of CAC 100 years ago was further sanctioned by God through His visit to Nigeria 12 years (1918-1930) into the life of the church. Nigeria witnessed the awesome visitation of God in the year 1930 through the call and revival of the 1st General Evangelist of our Mission, Apostle Joseph Ayo Babalola. It is an indubitable fact that Apostle Joseph Ayo Babalola is one of the makers of modern Africa. His exploits are contained in compendiums all over the world. His apostleship can never be controverted by subsequent generations; he is a spiritual yardstick of God’s power in Nigeria and beyond. The Hundred years of CAC has evolved and carved a niche for this mission through the instrumentalities of the spiritual juggernauts. Christ Apostolic Church is a forte and we are known for Salvation, sanctification, baptism of the Holy Spirit, holiness, purity of heart, healing, miracles, signs, wonders, missions, evangelism, prophetic gifts, gifts of the spirit and prevailing prayers. Prevailing prayer is one of our strengths which we learnt from our fathers. I recall at a time when Apostle Ayo Babalola wanted to have dinner and as we customarily bless our meals before we eat, Babalola began to pray over the meal and did not rise from his kneels praying till the following day. Little wonder we are referred to as a praying Church or a church that prays. Christ Apostolic Church is very unique in that we place spiritual emphasis on the power of the Holy Spirit to do exploit for our Saviour. This manifests in our emphasis on prayers. Our church boasts of undoubted prophetic gifts and has produced many national and international prophets, the likes of Prophets Samson Oladeji Akande, David Odulana Babajide, Peter Latunji, Jacob S. B Odusona, Samuel Abiara, Hezekiah Oladeji, etc. Our church has also been blessed with seasoned church administrators like Pastors Oba I. B. Akinyele, David O. Odubanjo, Joseph Bolade Orogun, Abraham Olutimehin, Joshua Adeniran Medayese, Elijah Titus Latunde, E.H.L. Oluseye, J. D. Obafemi, Daniel Oloye, Paul Bandele, Abraham Olukunle Akinosun, Samuel Oladele and a host of others. Christ Apostolic Church’s contribution to Christianity is brought to the fore as the space for worship was prepared and all fallow grounds broken up. We are a church that sponsors missionaries to countries in Africa, Europe, North and South America. The Church is blessed with several units like CACMA, Good women, Ministers wives Association. Youth Fellowship, Sunday School Department, Theological Seminaries and many more. Good Women Association of CAC is popular with that Yuletide-evergreen song “Odun-nlo-s’opin o, Baba rere.” I confidently say the fire of the first indigenous Pentecostal church was ignited by this church in Nigeria. Let somebody shout Hallelujah!!! For purposes of this celebration, permit me to encourage you and commend to you how our fathers walked with God and God moved in our midst and His Church for the past hundred years. Let me succinctly bring to the fore the very importance of this centenary by commencing with this question; what does walking with God mean? Walking with God means moving alongside God in unity and faith as you pass through Life’s journey. Most importantly, Focusing on God and following His lead will keep you on the right path. Think about walking with someone in the physical world. To understand what it means to walk with God on a spiritual level, consider what it means to literally take a walk with a friend or relative. When you take a walk with someone, the two of you are traveling in one direction. Just as Amos 3:3 says two can only walk except they agree, your steps move at a similar pace so that neither one of you leaves the other behind. You talk with each other and your attention remains on each other. In short, there is an overall sense of harmony, unity and community between the two of you during your walk. Enoch is the first person in the Bible said to walk with God. According to the Scripture, “Enoch walked with God three hundred years and had sons and daughters. So all the days of Enoch were three hundred and sixty five years. And Enoch walked with God and he was not for God took him away.” (Genesis 5:22-24). The crux of this passage is that Enoch was in close community with God throughout all the years of his life, so much that God took him away to paradise at the end of his days. This is telling us that walking with God opens up the clear pathway to heaven and our lives will be significant, purposeful and impactful. The afore-stated is by no means exhaustive but is very cogent and important to make us pull ourselves into the essence of this celebration. We need to walk with God more than ever before in order to bring about the move of God. The end-time revival needs to start with you. Please allow the Holy Spirit. 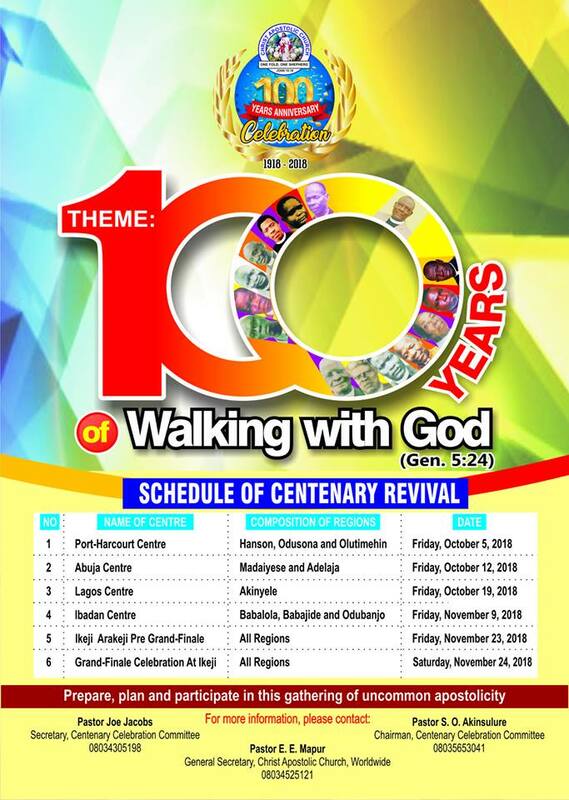 So, I welcome you to the most important event in the annals of Pentecostalism at this moment which is the commemoration of 100 years of seamlessly walking with God in Christ Apostolic Church (worldwide). By this centenary celebration, dried bones will live again, the church will regain her Pentecostal light again, the church will be repositioned and there will be renewal of vision that produces an end time revival for the whole world. I decree by the name of Jesus, God shall give to you a centenary miracle, I decree a harvest of centenary healings, centenary blessings, and centenary deliverance in the mighty name of Jesus. I declare this celebration open in the name of God the Father, of the Son and the Holy Spirit, Amen.